"Enable vlan fuctionality " doesn't show up in recent trunk's switch menu. 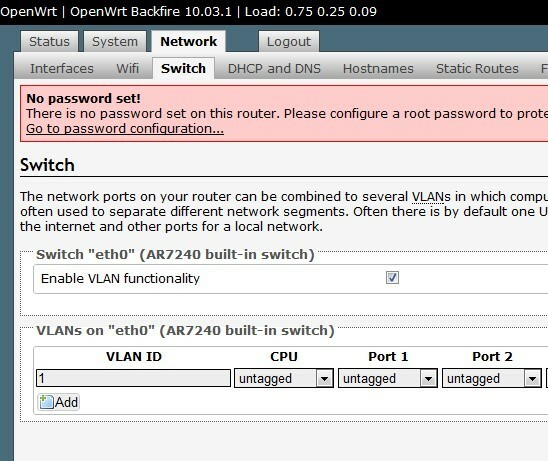 We have "Enable vlan fuctionality " in backfire,but not in recent compiled trunks.As a result,computers under this openwrt router can't not communicate with each other.I've compiled mr3420 and dir-615-c1,same result. vlan.jpg​ (77.1 KB) - added by axishero 6 years ago. vlan-trunk.jpg​ (54.8 KB) - added by anonymous 6 years ago.